Traditionally, the fall season, following the summer doldrums, is the time for audacious exhibitions that garner attention and big crowds. This fall is no exception, but some smaller exhibitions look promising, too. Here are a few I’m looking forward to seeing (and some I’m participating in), listed in chronological order. Ralph Fasanella: Lest We Forget, American Folk Art Museum, New York, NY. September 2 – December 1, 2014. 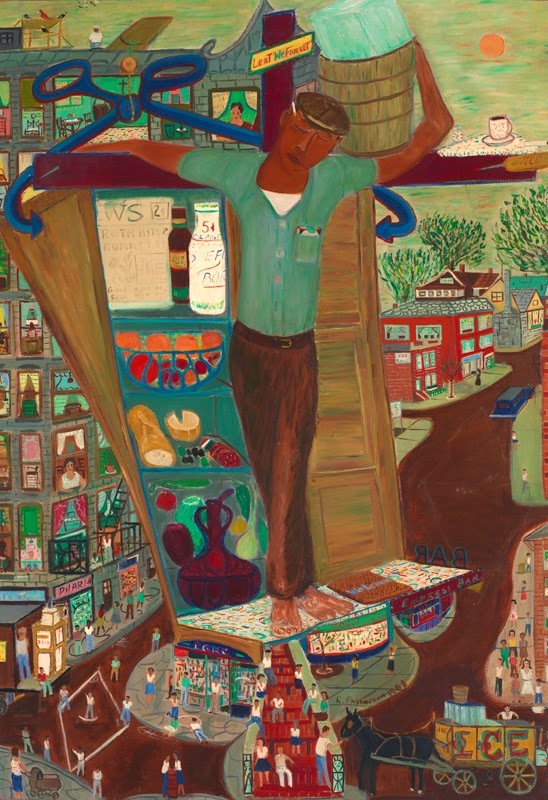 From the press release: Ralph Fasanella (1914–1997) celebrated the common man and tackled complex issues of postwar America in colorful, socially minded paintings. This exhibition celebrates the one hundredth anniversary of the artist’s birth and brings together key works from a career spanning 52 years. Fasanella was born in the Bronx and grew up in working-class neighborhoods of New York; he became a tireless advocate for laborers’ rights, first as a union organizer and later as a painter. Francesco Clemente, The Rubin Museum of Art, New York, NY. September 5, 2014 – February 2, 2015. From the press release: The first museum exhibition devoted to the Indian influences in Clemente’s work and how they relate to the artistic practices and traditions of various regions in India features approximately 20 works, including paintings from the last 30 years, and four new, larger than life-size sculptures created especially for the exhibition. In contrast to leading conceptual art practices of the 1970s, Clemente refocused attention on representation, narrative, and the figure, and explored traditional, artisanal materials and modes of working. From the Margins: Lee Krasner and Norman Lewis, 1945–1952, The Jewish Museum, New York, NY. September 12, 2014 – February 1, 2015. From the press release: Through select paintings by both artists, this exhibition offers a revealing parallel view of two key Abstract Expressionists. Lee Krasner and Norman Lewis, a woman and an African American, each experimented with approaches that joined abstraction and cultural specificity. Their work similarly brims with gesture, image, and incident, yet was often overlooked by critics in their time. Thread Lines, Drawing Center, New York, NY. September 19, 2014 – December 14, 2014. From the press release: This group exhibition features sixteen artists who engage in sewing, knitting, and weaving to create a wide-range of works that activate the expressive and conceptual potential of line and illuminate affinities between the mediums of textile and drawing. 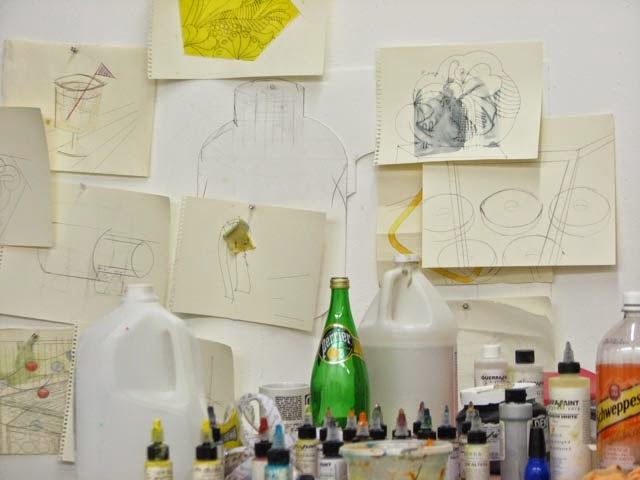 List of Participating Artists: Mónica Bengoa, Louise Bourgeois, Sheila Hicks, Ellen Lesperance, Kimsooja, Beryl Korot, Maria Lai, Sam Moyer, William J. O’Brien, Robert Otto Epstein, Jessica Rankin, Elaine Reichek, Drew Shiflett, Alan Shields, Lenore Tawney, and Anne Wilson. Egon Schiele: Portraits, Neue Gallery, New York, NY. October 9, 2014 – January 19, 2015. From the press release: The show focuses on six groupings of the artist’s work: Family and Academy; Fellow Artists; Sitters and Patrons; Lovers; Eros; and Self-Portraits and Allegorical Self-Portraits. In addition, there will be a special display highlighting a traumatic and pivotal period in Schiele’s life: his arrest and imprisonment during the spring of 1912. The exhibition documents an evolution of the artist’s style, both pre- and post-imprisonment. Schiele’s controversial achievements and untimely death at the age of 28 in World War I add a mythic quality to his abbreviated career. ZERO: Countdown to Tomorrow, 1950s–60s, Guggenheim, New York, NY. October 10, 2014 – January 7, 2015. From the press release: Featuring more than 40 artists from 10 countries, the exhibition explores the experimental practices developed by this extensive ZERO network of artists, whose work anticipated aspects of Land art, Minimalism, and Conceptual art. ZERO encompasses a diverse range of media including painting, sculpture, works on paper, installations, and archival materials such as publications and photographic and filmic documentation. The exhibition is organized around points of intersection, exchange, and collaboration that defined these artists’ shared history. Among the themes explored are the establishment of new definitions of painting (such as the monochrome, serial structures, and fire and smoke paintings); the introduction of movement and light as both formal and idea-based aspects of art; the use of space as subject and material; the interrogation of the relationship between nature, technology, and humankind; and the production of live actions or demonstrations. Henri Matisse: The Cut-Outs, Museum of Modern Art, New York, NY. October 12, 2014 – February 8, 2015. Blockbuster alert. Get your tickets in advance. From the press release: In the late 1940s, Henri Matisse turned almost exclusively to cut paper as his primary medium, and scissors as his chief implement, introducing a radically new operation that came to be called a cut-out. Matisse would cut painted sheets into forms of varying shapes and sizes—from the vegetal to the abstract—which he then arranged into lively compositions, striking for their play with color and contrast, their exploitation of decorative strategies, and their economy of means. Initially, these compositions were of modest size but, over time, their scale grew along with Matisse’s ambitions for them, expanding into mural or room-size works. A brilliant final chapter in Matisse’s long career, the cut-outs reflect both a renewed commitment to form and color and an inventiveness directed to the status of the work of art, whether as a unique object, environment, ornament, or a hybrid of all of these. Jean Dubuffet: Soul of the Underground, Museum of Modern Art, New York, NY. October 18, 2014 – April 5, 2015. 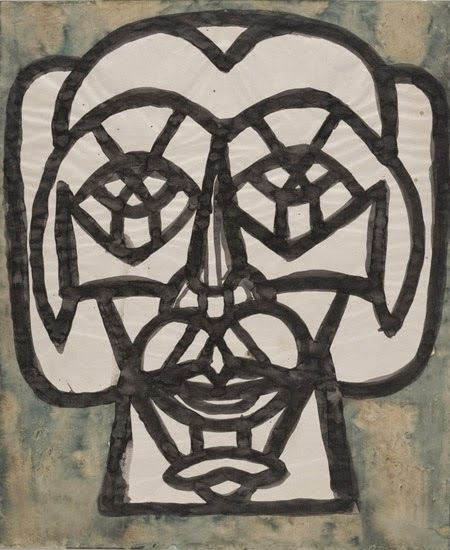 From the press release: Jean Dubuffet (French, 1901–1985) maintained a rebellious attitude toward prevailing notions of high culture, beauty, and good taste, and was a relentless innovator…. He mixed sand, gravel, and other materials into his pigments, applying them in layers with brushes and palette knives to create a thickened impasto, and then excavated images from them by scratching and scraping away with the pointed handle of his paintbrush. Chris Ofili: Night and Day, New Museum, New York, NY. October 29, 2014 – February 1, 2015. From the press release: Over the past two decades, Ofili has become identified with vibrant, meticulously executed, elaborate artworks that meld figuration, abstraction, and decoration. In his extremely diverse oeuvre, Ofili has taken imagery and inspiration from such disparate, century-spanning sources as the Bible, hip-hop music, Zimbabwean cave paintings, blaxploitation films, and William Blake’s poems. As the title of the exhibition suggests, Ofili’s practice has undergone constant changes, moving from boldly expressive to deeply introspective across an experimental and prodigious body of work. The exhibition will feature over thirty of Ofili’s major paintings, a vast quantity of drawings, and a selection of sculptures from over the course of his 20-year career. 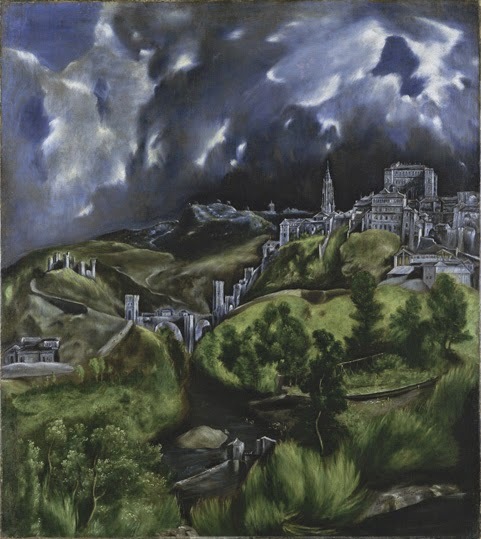 El Greco in New York, Metropolitan Museum, New York, NY. November 4, 2014 – February 1, 2015. The Forever Now: Contemporary Painting in an Atemporal World, Museum of Modern Art, New York, NY. December 14, 2014 – April 05, 2015. From the press release: A-temporality, or timelessness, manifests itself in painting as an ahistorical free-for-all, where contemporaneity as an indicator of new form is nowhere to be found, and all eras co-exist. This profligate mixing of past styles and genres can be identified as a kind of hallmark for our moment in painting, with artists achieving it by reanimating historical styles or recreating a contemporary version of them, sampling motifs from across the timeline of 20th-century art in a single painting or across an oeuvre, or radically paring their language down to the most archetypal forms. Work by Richard Aldrich, Joe Bradley, Kerstin Brätsch, Matt Connors, Michaela Eichwald, Nicole Eisenman, Mark Grotjahn, Charline von Heyl, Rashid Johnson, Julie Mehretu, Dianna Molzan, Oscar Murillo, Laura Owens, Amy Sillman, Josh Smith, Mary Weatherford, and Michael Williams. I feel obliged to point out that except for the Jewish Museum, which is mounting Lee Krasner’s work in a two-person exhibition, there are conspicuously few museum retrospectives featuring work by women this fall. Is the dearth of women’s shows an indication that museums lack confidence in our work? I would love to see major museum retrospectives for Jacqueline Humphries, Andrea Zittel, Agnes Martin, Elizabeth Murray, Nancy Rubins and Jessica Stockholder, to name a few. include Susan Rothenberg for a major retrospective. Do we all have to take on male monikers?